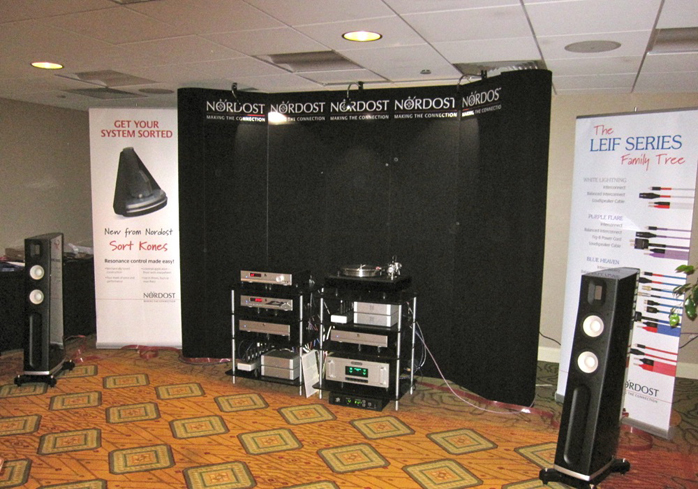 MBL North America: MBL is one of the few manufacturers who makes a complete system - and a damned fine one at that. My friend Peter Breuninger has always been telling me how much he likes his MBL speakers but I have visited the MBL room in years past and never really had any super-exciting experience. The system this year was a true eye opener however. There is either some very special design work being done on these entry-level MBL Corona series products (i.e., less is more) and/or there is a special synergy going on that did not exist before. On the other hand after reading about the new MBL 126 speaker ($11.800/pr) I heard here, I am sure it was a large part of the high level of performance from this smaller system. Jeremy Bryan, President and CEO of MBL North America, sat me down in the center seat and played an orchestral pops number called Pops Hoedown from an old Telarc CD titled Round Up. The CD file was ripped to a custom Linux Sonore server and played back through the asynchronous USB input on the MBL C31 CD player (which also features S/PDIF and optical inputs). This was a highly dynamic and detailed recording with lots of high-impact percussion in both treble and bass. 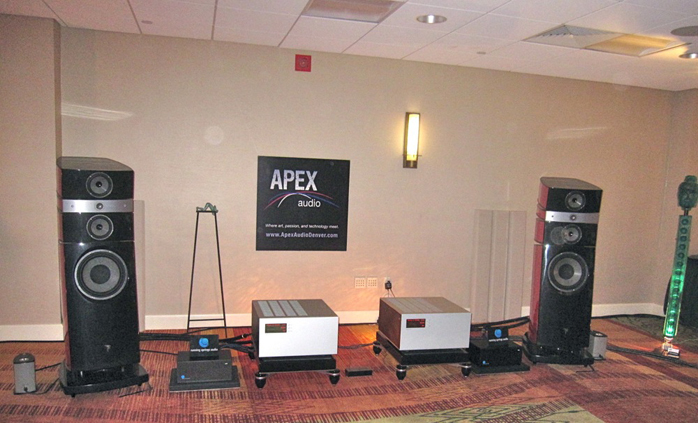 The energy from these speakers was astonishing while maintaining resolution, musicality and complete control. Another cut had a harmonica solo and my notes just said "so real!". 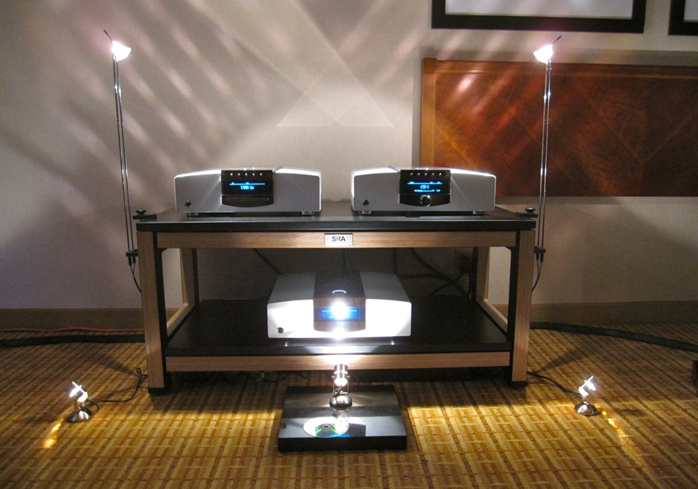 This was the one system at the show that actually had me fleetingly fantasizing about dumping my whole system and getting it (there was no phono though)! On a Higher Note - Luxman, Brinkman, Audio Aero, Vivid Audio, Tweak Geek: This year Philip O’Hanlon was showing the smaller Vivid Audio B1 in the same large mezzanine room as last year. Philip was trying to show that the lower-cost speakers as well as the lower-cost 30wpc Luxman amp could get one a big chunk of the same audio goodness as the bigger Vivid/Luxman system he played last year. While dynamics and scale were naturally not of the same order, the sublime musicality and almost surreal openness of the system was just as strong. Philip played some 15ips tapes (Elvis Presley The Ghetto, The Beatles Eleanor Rigby) on a modified Revox open-reel tape deck. The Eleanor Rigby track was a multichannel recording that had been re-encoded for surround effect with two channels. Don’t ask me how but it was some highly talented recording engineer who did it. he soundstage on this track was phenomenal. Philip spun some vinyl too on a Luxman turntable of all things! Never thought I would see that. I noted an almost unreal sense of finesse and refinement again showing that this lower-priced system can still do a lot to satisfy. My only criticism, which I see John Atkinson also noted, was a modest midbass "bloom" to borrow his term. 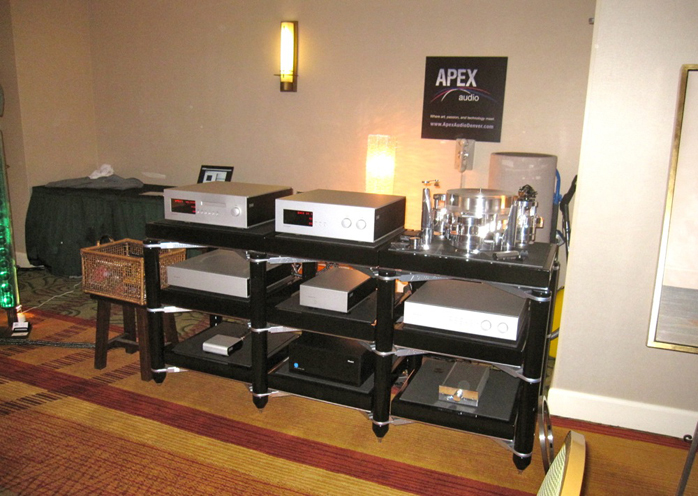 Apex Audio – Focal, Air Tight, Soulution, Transrotor, Running Springs Audio, Critical Mass Systems, TARA Labs: While I admire the tremendous amount of work that went into assembling the formidable component set (Focal Stella Utopia EM Loudspeakers $90.000/pr, Soulution mono amps and preamp, Transrotor turntable and Air Tight cartridge etc. ), the cuts I heard whilst in the room were exciting a fairly substantial bass resonance, so much so that I had a hard time listening around it. There was a guitar and cello recording playing and the high resolution of the system in the midrange and treble was plainly evident. Beyond that I must refrain from comment. 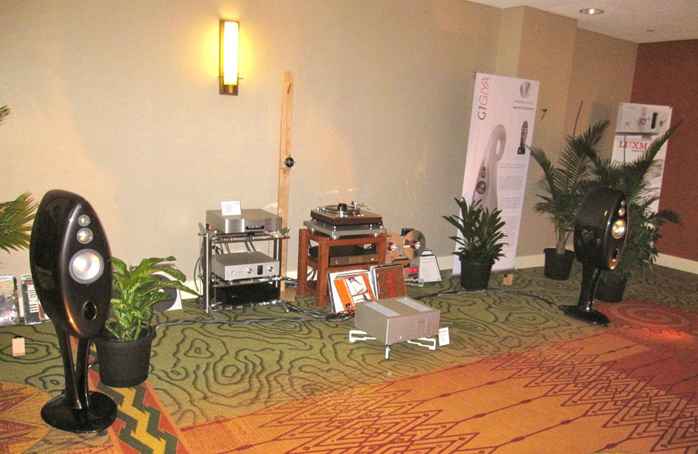 Musical Surroundings – Vandersteen, Running Springs, Fosgate, Clearaudio, Benz-Micro, Graham, Harmonic Resolution Systems, Aesthetix: This was the second room I saw to use the Vandersteen Model 7 speakers. I much preferred the sound of them in this room. Diana Krall who I do not consider a good test of a system (she sounds good on a boom box) was playing from a computer file. A better test was a Lightnin’ Hopkins LP played on the Clearaudio turntable with the Graham tonearm and Clearaudio cartridge. I could listen all day in this room without a problem. 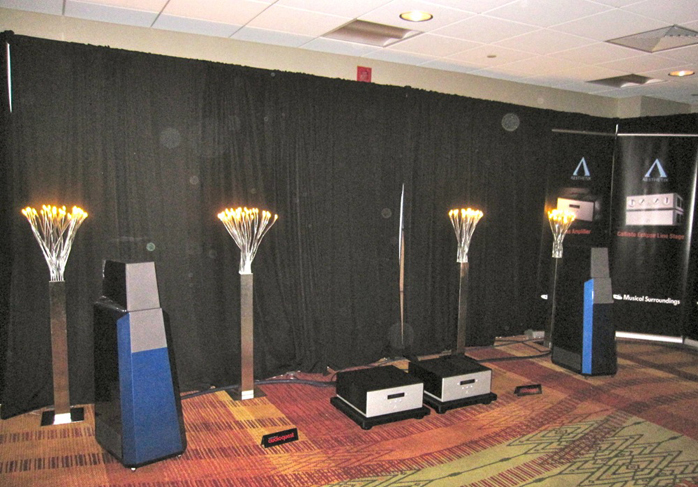 Nordost: Paul Richotte and other Nordost representatives were giving a demonstration of the QRT AC treatment products including the QBase AC distribution unit (audiophile power strip), Qx power purifier/field generator and the Qv2 AC line harmonizers. A visitor’s CD request (The Black Crows) was played without any of the QRT treatments. I noted that the vocal was hard and the soundstage s fairly confined. Sequentially Paul added more of the treatment devices and the sound improved with each step. At the end the sound was much much better. The vocal now was smooth and natural and the soundstage had increased in all directions. It was quite a remarkable demo on the effectiveness of the QRT products. In fact it was the most noticeable sonic improvement from an accessory product(s I have heard since the Stein Harmonizers which I purchased. I did not quite get the full story on the technology and I am sure some is proprietary but I plan to look into these in more detail. SimpliFi Audio – Gradient, Klangwerk, Bladelius: My apologies but I failed to take a photo in this room. 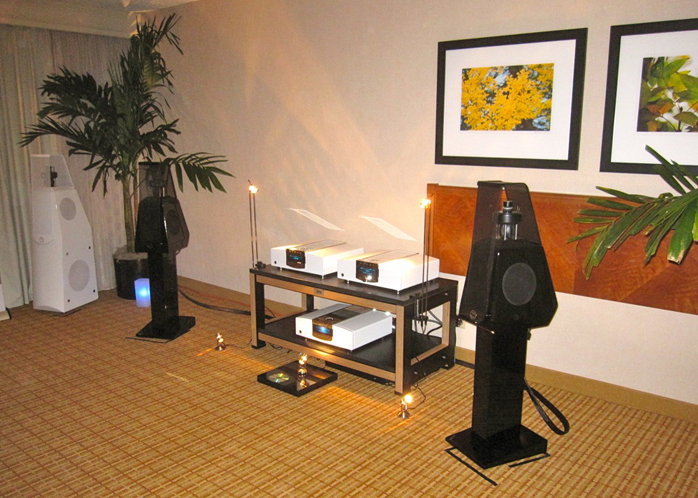 The Swiss-manufactured Klangwerk Ella 2-way powered speakers ($7.495/ea. and reviewed here were cranking Pink Floyd’s The Wall when I entered. These Bauhaus-styled speakers maintained soundstaging and tonal balance well when listening off-axis and standing or sitting as syndicated reviewer Jörg Dames commented on in his review. 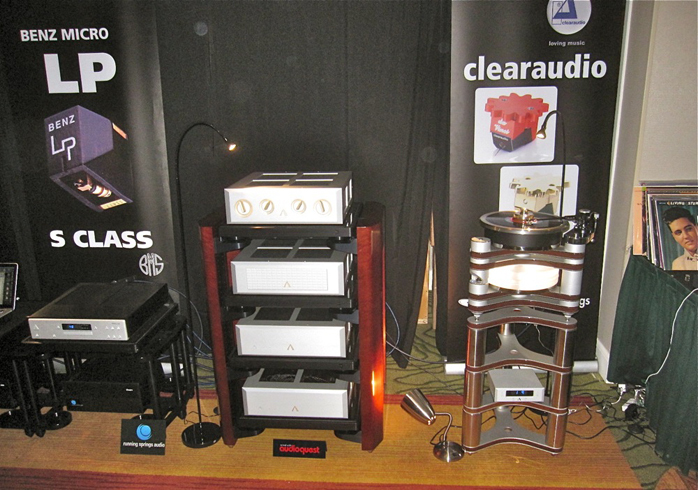 Among a growing number of do-it-all digital media players/servers introduced at this show was the Bladelius Embla reviewed here. It is a versatile component that contains an analog preamplifier, world-class DAC based on their reference CD-player, the Gondul M, internal flash memory up to 2TB, USB connection for external files on hard drives/memory sticks/networks/streaming PC, and finally an Ethernet port for connection to the internet where it can access album metadata for display. Insert a CD and you can either play it directly from the disc or store it to the internal flash memory. Note that it does not read AIFF files. The Gradient Revolution Active speakers ($9.995/pr) were played briefly before I left. The show was beginning to shut down. These put a smile on my face like seeing an old friend. This is a well-balanced speaker that probably now deserves being called a classic. The show shut down right as I was visiting this last room. Huge crates were being wheeled out to waiting vans and trucks at the curb and I had a mixed feeling of satisfaction and sadness to see it end. Upon arriving back home it is always interesting to turn on your own stereo again and listen in the light of all those show system memories. Thankfully I am still very happy with what I hear at home. As I sat listening and writing I mulled over all of the rooms and came up with my “Best Of Show” list.